Details : Quiet country location away from the road. 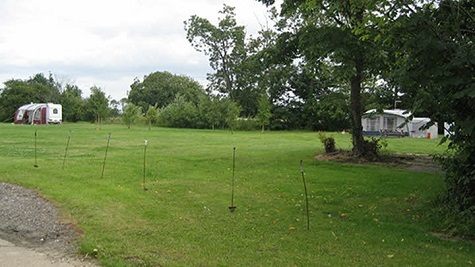 Large site with plenty of hook ups on either hard or grass standing. Close to the picturesque villages of Lavenham and Long Melford, centrally placed for numerous National Trust Properties. 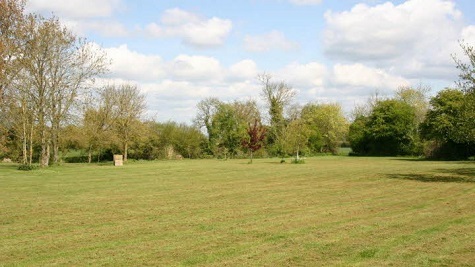 Situated on an arable farm surrounded by fields and wildlife. No light pollution, so the views of the open skies and wonderful sunsets a speciality. 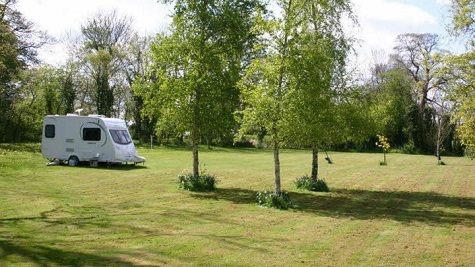 Situated in the heart of the Suffolk countryside up a long drive making the site very peaceful and relaxing. 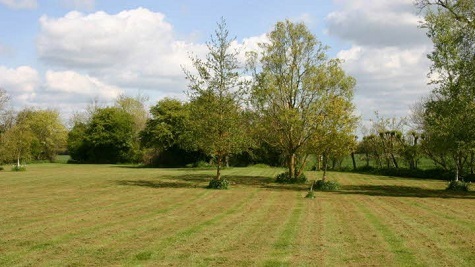 Situated close to a number of National Trust Properties and with easy access to the coast. We look forward to welcoming you to our CL. 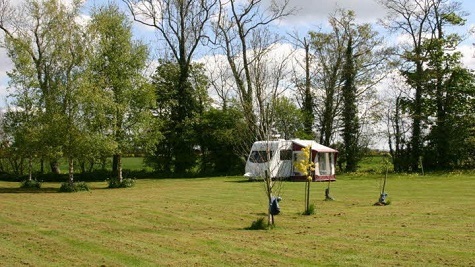 Facilities : Adults only, Electric hook up available, Easy access, Suitable for Caravans and Motorhomes, Grass and Hardstanding pitches, Scenic views, Toilet, Shower, Wi-Fi, Dogs allowed, B&B, Golf nearby, Fishing nearby, Disabled facilities, Shop nearby, TV reception good. We spent a couple of nights here at the end of a break in East Anglia and wished we had left time to stay for longer. 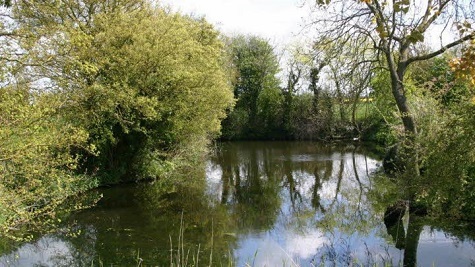 It's a very attractive site with a pond (beware the mosquitoes in the evening) and lovely views beyond. 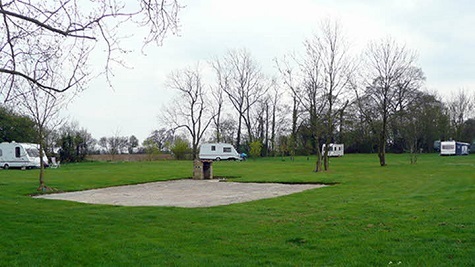 We have a motorhome and need hardstanding in March/April, so we pitched up on the picnic square in the photograph, with the owner's permission. This was level, which always helps. The owner was out and about when we arrived and came over to explain the location of the facilities. The toilet and shower were perfectly adequate for a CL, though the toilet emptying was the same building, which was slightly awkward. The site was large with vans well spaced and the whole place had a relaxing ambiance. Wish it had been warm enough to sit outside! My only caveat is dog poo on the field left by the owner's wandering black Labrador! You don't really want to walk to the loo with your eyes on the ground! 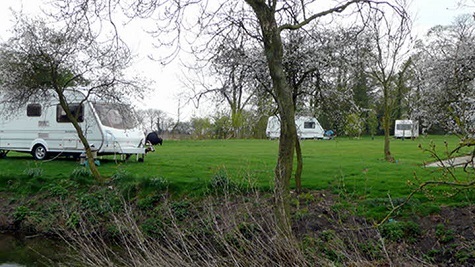 The visitors kept their dogs on a lead and took them off site for walks. We will definitely be back though - this a lovely base to explore the glorious villages of mid Suffolk. We have just spent a really enjoyable week on the site. The owner was always very cheerful. She went out of her way to help us. The site was well looked after and the shower was always nice and hot. Will recommend the site and hope to be back again next year. We have stayed at Stanstead Hall a number of times now and view it as our chilling out place away from the stresses and noise of busy town life. Stansetaed Hall is working arable farm with fields of crops surrounding the CL with obivious seasonal tractors and other farm machinery. The site is access from a lane via a long drive allowing the CL to be situated away from roads so virtually no traffic noise. The site itself is mostly flat well kept grass with some H/standings. The toilets and shower are housed in the adjacent farm buildings and suitable for wheelchair access, the recycling area is also in these buildings. The internet is what you would expect in the middle of nowhere that is slow occasionally tripping out but its there. Poppy the Labrador could be contrued as a nuiscence by some but as the notices say dont feed her and shoo her away if you dont want her visiting, the geese are noisy and poo but it is a farm. The wildlife consists of numerous ducks, Roe, Munjack deer, owls, buzzards, swallows and martins with the occasional Hobby. This is a wonderful place that very occasionally at changeover times gets busy but it is now our haven and we will be revisiting very soon. HappyWe have just spent 10 days at this lovely cl .If you want peace and quiet then this is the place to go. We had no problems with too many vans on site in fact we were the only ones on there for some of the time. The facilities are basic but adequate with plenty of hot water. CLs do not have to provide a shower, let alone a loo so we always see those that do as a bonus ,as long as they are clean .We will be back for some more relaxation and cycling in this lovely part of the world. My wife and I have been visiting this CL two or three times a year since it opened several years ago. It's still our favourite CL after all this time. The owner is always welcoming and helpful - nothing is too much trouble. Sue once even helped us to find our runaway dog which turned up in the next village some hours later. It's tranquil, having no main roads nearby, a beautiful setting, and the facilities are more than adequate and always clean. We have a wonderful time every time we visit and have no hesitation in recommending a stay at any time of the year. Directions : Turn left off the B1115 Hadleigh - Stowmarket 0.75 miles past village shop in Hitcham signposted Brettenham, nr mast, in about 0.75 mile turn right into road signposted Buxhall, Rattlesden. Within 0.5 mile turn right into farm drive, pass through gate and turn left immediately past farm barns. Site is on the right, site van owner will call.